The title of Soad Abdel-Rasoul’s new exhibition at the Mashrabiya Gallery, “Virtual Garden”, has both a positive connotation of beauty and life and a negative one — the virtual — that seems to negate it. The images have an almost magnetic power, however, making the experience akin to a museum visit. 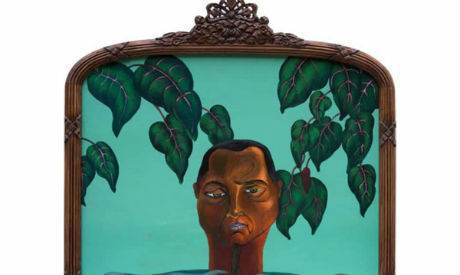 But the unique, finely decorated frames around the paintings make each as unique as plant species while the characters within have the immediacy and realism of real people. What places them at something of a distance are the magic realist compositions designed to underline the suffering of women in our society. By turns subtle and exaggerated, the depression, anxiety and uncertainty in which the female figures who live in these paintings wallow generate a love-hate relationship with the imagery. In Look at Your Heart Twice, for example, a woman with two differently sized faces, the bigger one streaked with fluorescent green, sits in a meditative posture. In her right palm she holds a human heart, the veins of which sprout leaves and grapes. Unlike women, men appear only occasionally in this collection: a timid, negative presence. The fake man features an evil-looking, fox-like Cyclops holding a white flower who recalls a coloniser or smooth operator. The fur man wears a fur coat and is displayed in a paravane-like-frame; the ice-cold look in his eyes sets him apart. Feminist angst or psych-social analysis? In Lonely, an old woman holds one vein in her hand while another encircles her neck. She is immobile with no apparent desire to move, though an open window in the light-brown background suggests hope or imminent change. Moral conflict comes to the fore in Man and two women, in which a naked man — his face betraying no concern — is surrounded by the waves while he holds a vein with yellow flowers growing out of it that joins the heads of two drowning women. According to Abdel-Rasoul, “This collection deals with the concept of soft constraints which bind one to another, like motherhood, marriage and friendship. The idea jumped into my head during my last visit to Orseille Museum in Paris. The colour and brightness of the paintings, and the acrylic paints used, should act to wake viewers up. Yet, testifying to the artist’s success, they induce a meditative state. Recalling art deco, the frames have their own story. Collected at various antique shops where they surrounded mirrors in Cairo, Kenya and France, they represent the power of constraint. Born in 1975 in the old district of Shobra, Abdel-Rasoul holds an MA and a PhD in the history of art from Helwan University’s Faculty of Arts. She designed book covers before she dedicated herself wholly to painting starting in 2008, when she gave her first solo exhibition at Grant Gallery. In 2012, “The Miracle of Maps”, drawing on anatomy as much as cartography, marked a transitional point in her career. Abdel-Rasoul has since travelled repeatedly to Kenya and Nigeria, where she studies rituals and inscriptions. And perhaps it is African mythology that makes it possible for her to produce such compositions as a donkey’s head on a human body.